Red Blood Cells (Erythrocytes) are made in the bone marrow in the centre of certain long bones. Red blood cells have nuclei when first formed, but lose their nuclei when mature. They live only about 4 months before being destroyed by the spleen and the liver. Red blood cells contain a red chemical called haemoglobin that attaches either to oxygen or carbon dioxide molecules to transport them around the body. White Blood Cells (Leukocytes) are made in bone marrow and the spleen. They live only 2 to 4 days, because their purpose is to fight infection. They either surround and ingest foreign particles or bacteria (macrophages that perform phagocytosis), or produce chemicals such as antibodies and antitoxins to neutralise the invading particles or bacteria. Platelets are small disc-shaped blood cells without a nucleus. They are formed in bone marrow, and play an important role in the clotting of blood. Did You Know That...? If a person's red blood cells were placed on top of one another, they would reach one-eighth of the distance to the moon. There are 3 main reactions that occur in the clotting of blood. When platelets are exposed to a rough surface such as that of damaged tissue, they disintegrate to produce a substance called thromboplastin. Thrombin then acts like an enzyme to convert fibrinogen (a soluble plasma protein) to fibrin that is insoluble. The fibrin fibres trap red and white blood cells to form a solid clot within minutes. Serum is the yellowish liquid that oozes from the shrinking clot. Arteries take blood away from the heart. They usually contain blood rich in oxygen. Arteries have elastic muscular walls that can dilate and constrict as each pulse of blood goes through. Veins take blood back to the heart. They contain valves that allow a one-way flow of blood. Veins are less muscular than arteries. Capillaries are the smallest and most numerous of blood vessels. The capillary diameter is only the width of one red blood cell, so blood travels slowly through capillaries. The capillary wall is only one cell thick to allow exchange of nutrients and oxygen into, and wastes such as carbon dioxide out of the body cells. There are 100 000 kilometres of blood vessels in the human body. Rubbing your eyes causes chemicals called histamines to be released and this causes swelling and darkness of the capillaries under the eyes. The result is dark circles under the eyes. The heart is a strong muscular organ used to pump blood. It has 4 blood-collecting chambers - 2 atria and 2 ventricles. Valves between the chambers allow one-way blood flow. The wall of the left ventricle is the thickest and strongest because blood from here is pumped all around the body. The heart has its own blood supply via the coronary artery. If this is blocked, a 'heart attack' may occur. The heart beats about 70 beats per minute. It is controlled through nerves from the brain stem (Medulla Oblongata). The heart beat is actually a 'double beat', with simultaneous contraction of the 2 atria, followed quickly by simultaneous contraction of the 2 ventricles. A node of nervous tissue called the sino-atrial node (SA node also called the 'pacemaker') in the right atrial wall, initiates a nervous impulse that travels to the atrio-ventricular node (AV node) lying between the atria and the ventricles. Then branching nerve fibres stimulate contraction - first atria, then ventricles. A normal person's blood pressure is about 120 / 80. The first number shows the pressure in blood vessels when the heart contracts, and is called systole. The second number shows the pressure in blood vessels when the heart relaxes and is called diastole. The device which measures blood pressure is called a sphygmomanometer. Eating too much fat and salt in the diet causes thickening of the walls of blood vessels, increasing the blood pressure because they are not as elastic. Pulmonary Circuit - Deoxygenated blood from the heart goes to the lungs via pulmonary arteries. Oxygenated blood from the lungs goes back to the heart via the pulmonary veins. Systemic Circuit - The aorta (the main artery from the heart) leaves the left ventricle, and branches to take blood to the head (carotid artery), arms and chest. Other branches from the aorta supply the liver, intestines, kidneys and legs. The Vena Cava (the main veins to the heart) return deoxygenated blood from the body. Did You Know That...? Cardiovascular diseases affecting the heart and blood vessels are the biggest cause of death worldwide. They may be prevented by healthy diet and exercise. Closed circulatory system - Blood is enclosed within a closed system of vessels that is pumped by a heart. Examples of animals with a closed system are active animals such as vertebrates and squids. 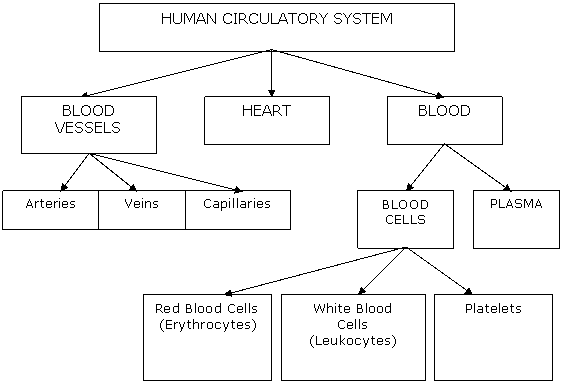 Open circulatory system - In some animals such as spiders, insects and snail, the body fluid surrounding cells (interstitial fluid) is circulated throughout the body. This fluid is pumped by a simple tubular heart into open-ended vessels to the cells. The fluid then eventually comes back to the heart. About 70% of carbon dioxide is transported in human blood as hydrogen carbonate ions in red blood cells. About 23% is combined with haemoglobin molecules in red blood cells. About 7% is dissolved in plasma, giving blood an acidic pH. All oxygen in blood is transported in combination with haemoglobin in red blood cells. However, human muscles also have a different form of haemoglobin called myoglobin that carries a reserve of oxygen for a limited period. The respiratory pigments for other animals vary. For example, earthworms and many molluscs have haemoglobin, whereas some molluscs and crustaceans have haemocyanin which turns blue when combined with oxygen.